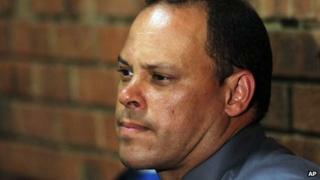 Hilton Botha, the former lead detective in the Oscar Pistorius inquiry, has resigned, South African police confirm. Det Botha was dropped from the investigation in February after it emerged that he was facing attempted murder charges in another case. He has also been heavily criticised for giving contradictory evidence at the bail hearing of Mr Pistorius. The Paralympic champion is accused of killing his girlfriend, model Reeva Steenkamp - a charge he denies. Mr Pistorius says he mistook her for a burglar when he shot her dead on 14 February. Ms Steenkamp, 29, died after the athlete fired multiple shots into the toilet of his apartment in a gated housing complex in Pretoria. Police said the veteran policeman's resignation was accepted with immediate effect but did not elaborate further on the reasons behind his decision. Det Botha, the first officer to arrive at the scene of the Valentine's Day shooting, was accused of mishandling the investigation after he amended his testimony during fierce questioning by Mr Pistorius's defence lawyers in last month's bail hearing. He told the court that the trajectory of gunshots through the bathroom door indicated that Mr Pistorius, a double amputee, was wearing his prosthetic legs and shot downwards through the door. This contradicted an earlier account given by Mr Pistorius, who said he was walking on his stumps and grabbed his gun because he felt vulnerable when he thought an intruder had entered. Det Botha then admitted that police had lost track of ammunition found inside the house, and was accused of not wearing protective clothing at the crime scene. The defence also countered his suggestion that testosterone and needles had been found in Mr Pistorius's bedroom, arguing instead that the substance was a herbal remedy. In addition, the bail hearing revealed that Det Botha was allegedly involved in the shooting of a minibus taxi loaded with passengers two years ago. Det Botha is set to appear in court in May, along with two other officers also accused of opening fire on the taxi. Mr Pistorius, who is charged with premeditated murder, was released on bail on 22 February and is due to appear in court again in June.